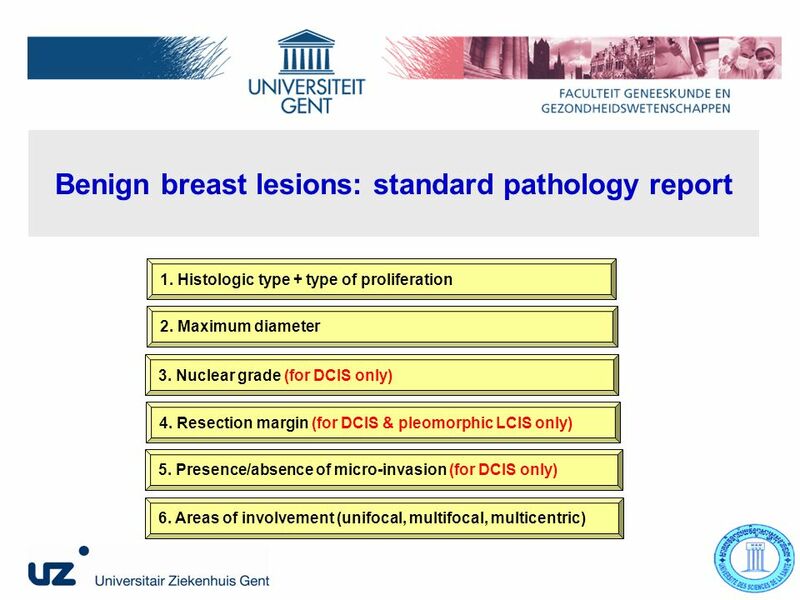 Updates on Breast Diseases: What clinicians need to know from pathologists Preah Bat Norodom Sihanouk Hopsital, 22 April 2009 Monirath Hav, MD, Ph.D. fellow. 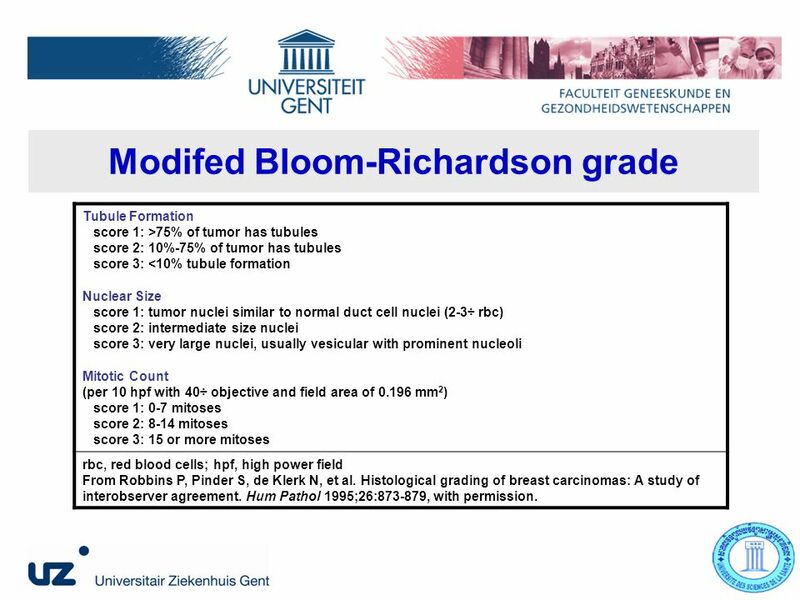 15 Modifed Bloom-Richardson grade Tubule Formation score 1: >75% of tumor has tubules score 2: 10%-75% of tumor has tubules score 3: <10% tubule formation Nuclear Size score 1: tumor nuclei similar to normal duct cell nuclei (2-3÷ rbc) score 2: intermediate size nuclei score 3: very large nuclei, usually vesicular with prominent nucleoli Mitotic Count (per 10 hpf with 40÷ objective and field area of 0.196 mm 2 ) score 1: 0-7 mitoses score 2: 8-14 mitoses score 3: 15 or more mitoses rbc, red blood cells; hpf, high power field From Robbins P, Pinder S, de Klerk N, et al. 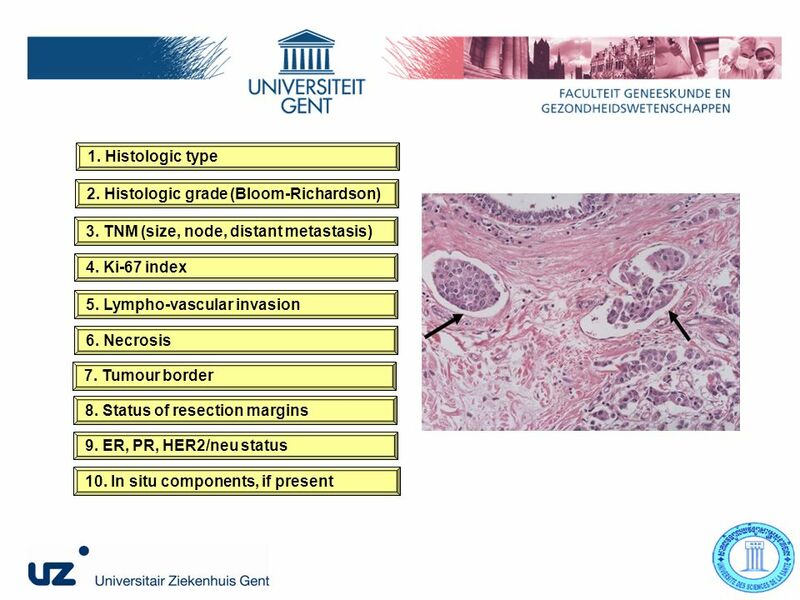 Histological grading of breast carcinomas: A study of interobserver agreement. Hum Pathol 1995;26:873-879, with permission. 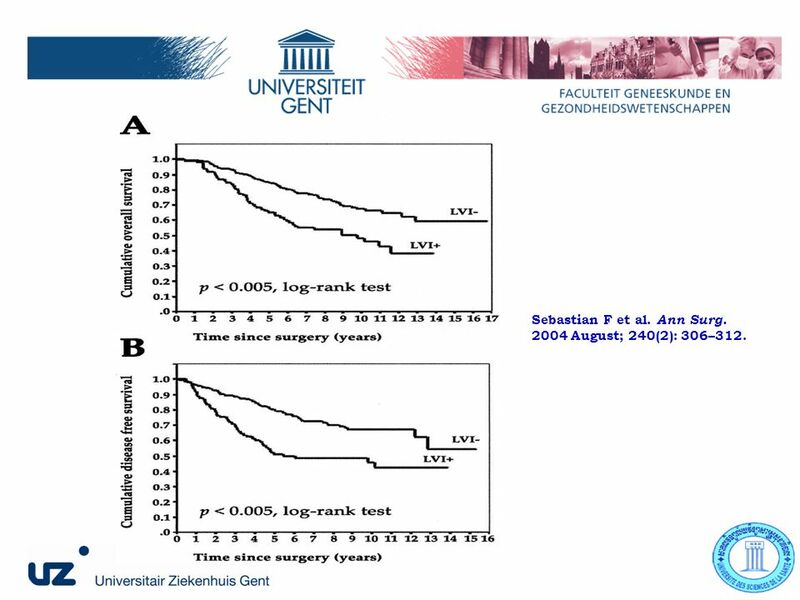 20 Sebastian F et al. 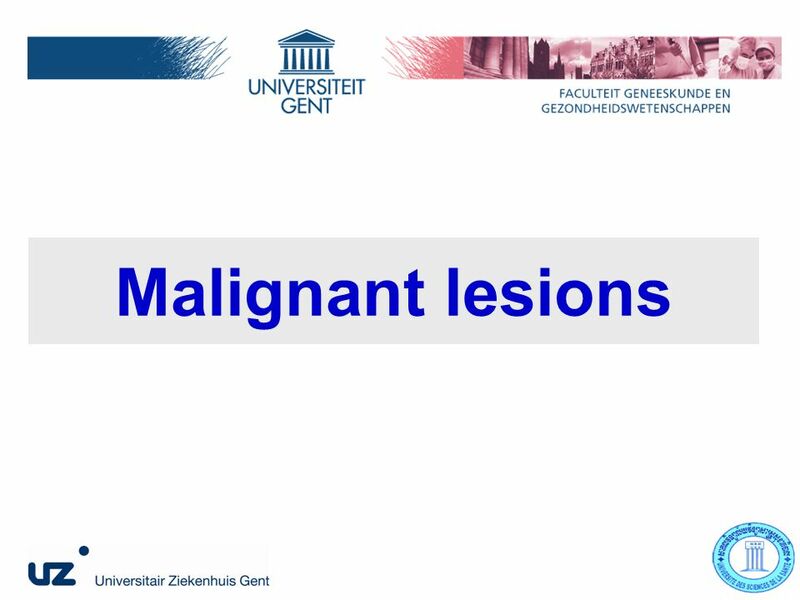 Ann Surg. 2004 August; 240(2): 306–312. 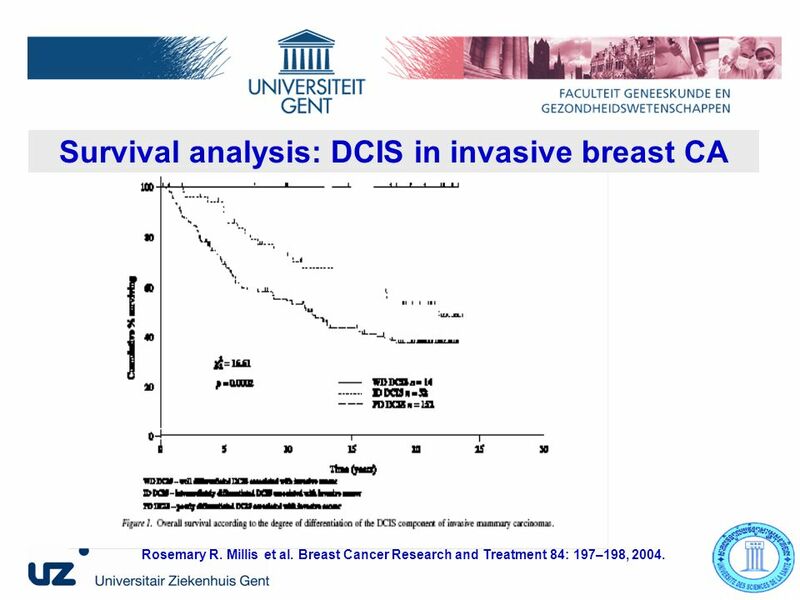 27 Survival analysis: DCIS in invasive breast CA Rosemary R. Millis et al. 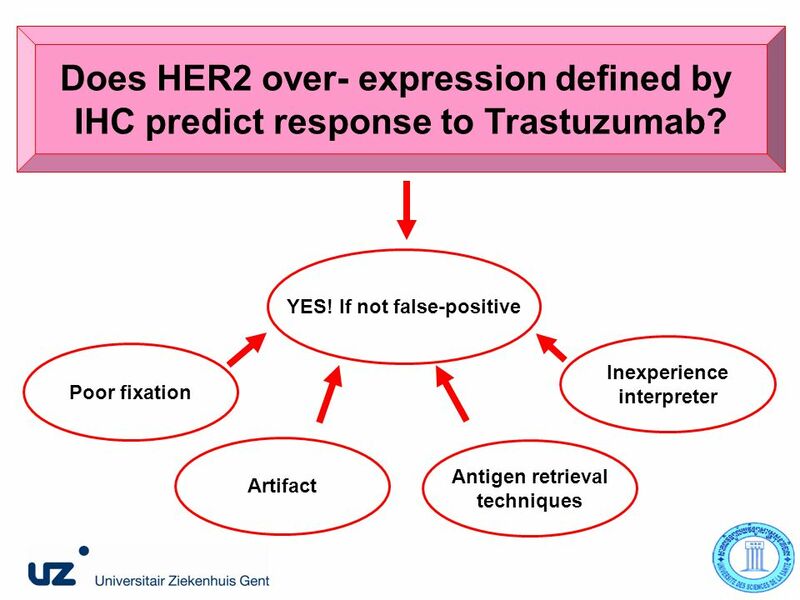 Breast Cancer Research and Treatment 84: 197–198, 2004. 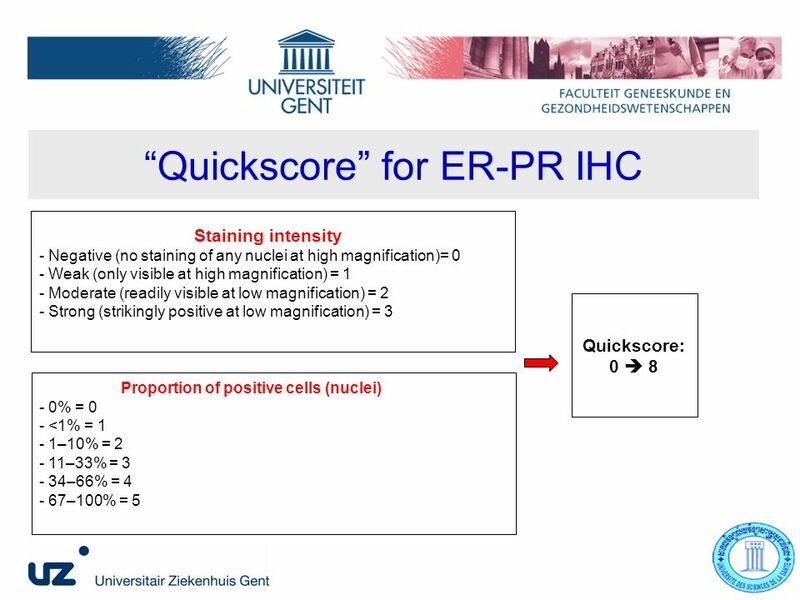 34 Quickscore : What should be the cut off? Harvey JM et al. J Clin Oncol. 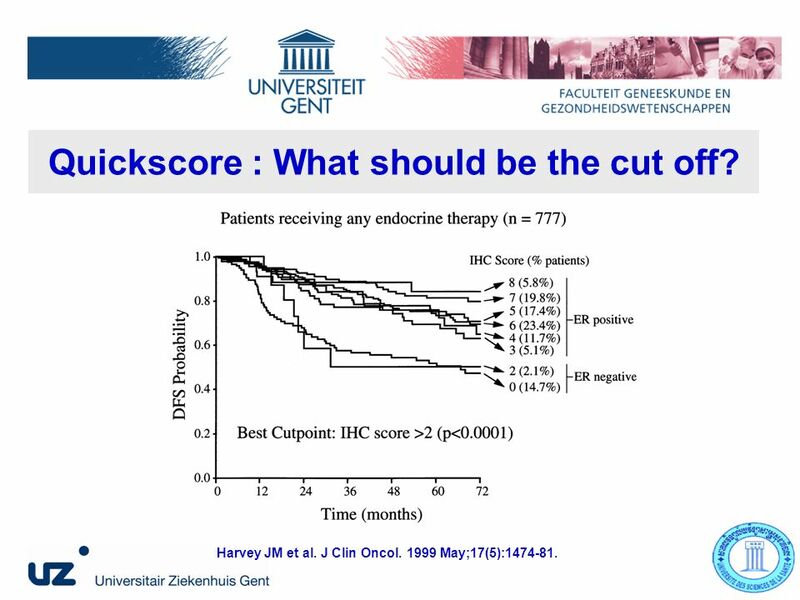 1999 May;17(5):1474-81. 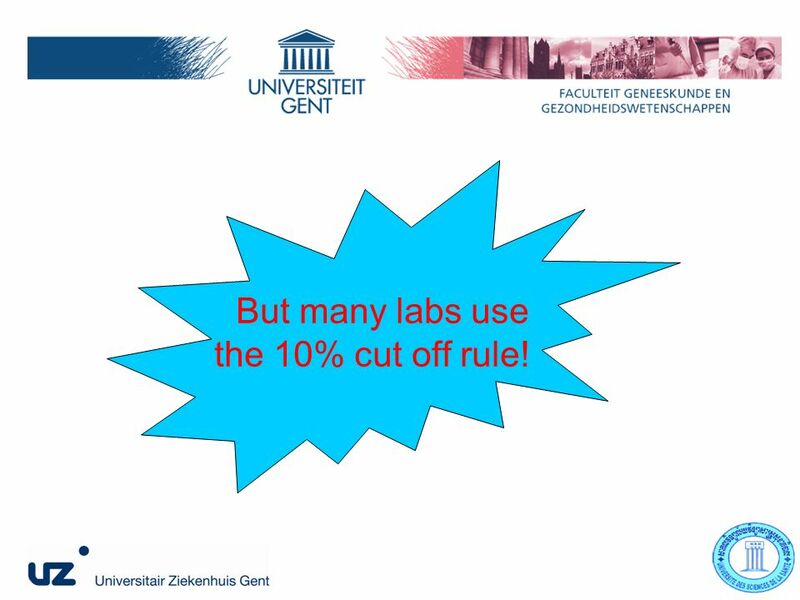 36 But many labs use the 10% cut off rule! 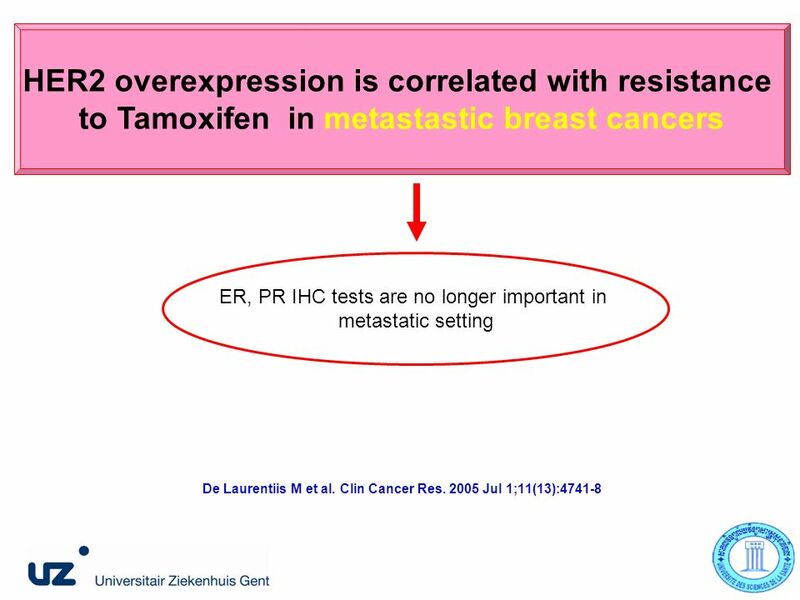 39 Mass R et al. 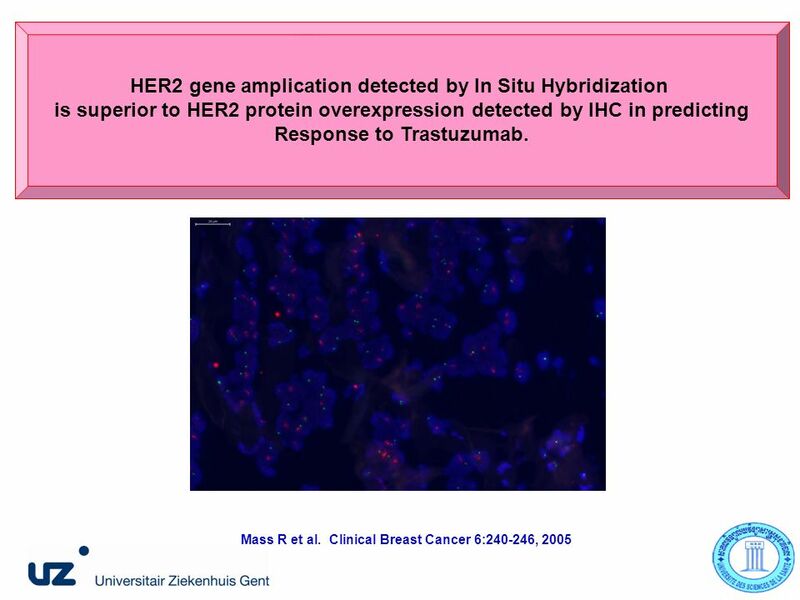 Clinical Breast Cancer 6:240-246, 2005 HER2 gene amplication detected by In Situ Hybridization is superior to HER2 protein overexpression detected by IHC in predicting Response to Trastuzumab. 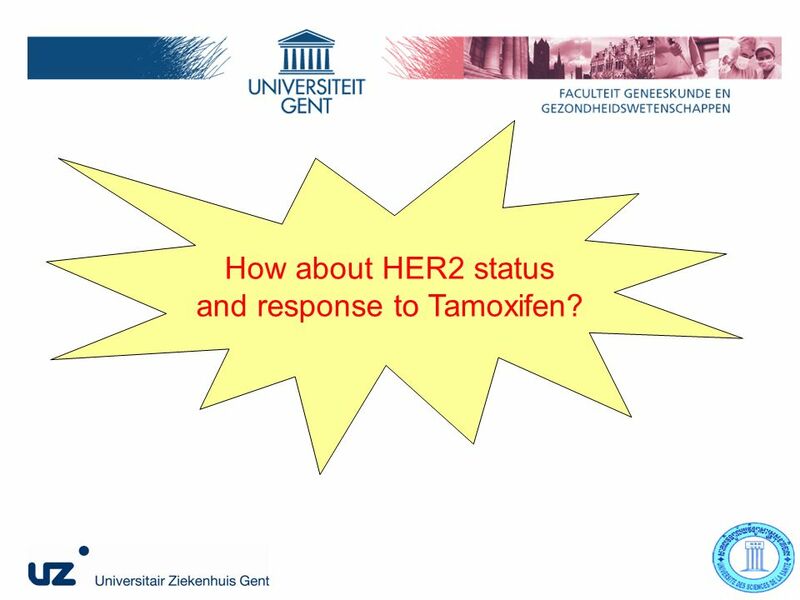 42 How about HER2 status and response to Tamoxifen? 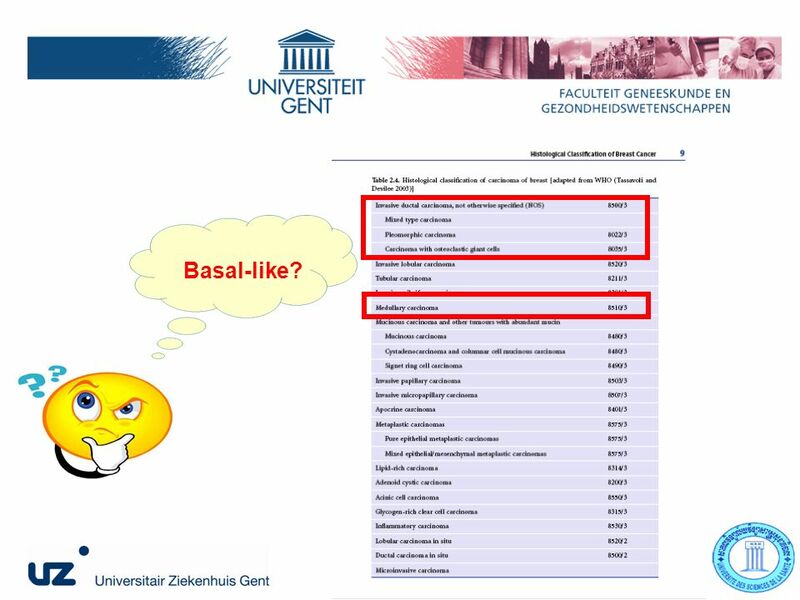 45 Should we trust all these studies? 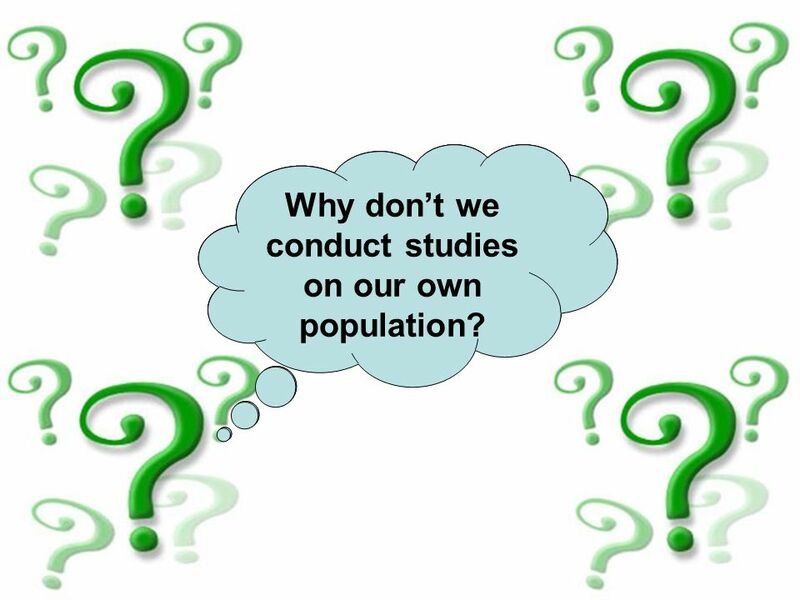 Why dont we conduct studies on our own population? 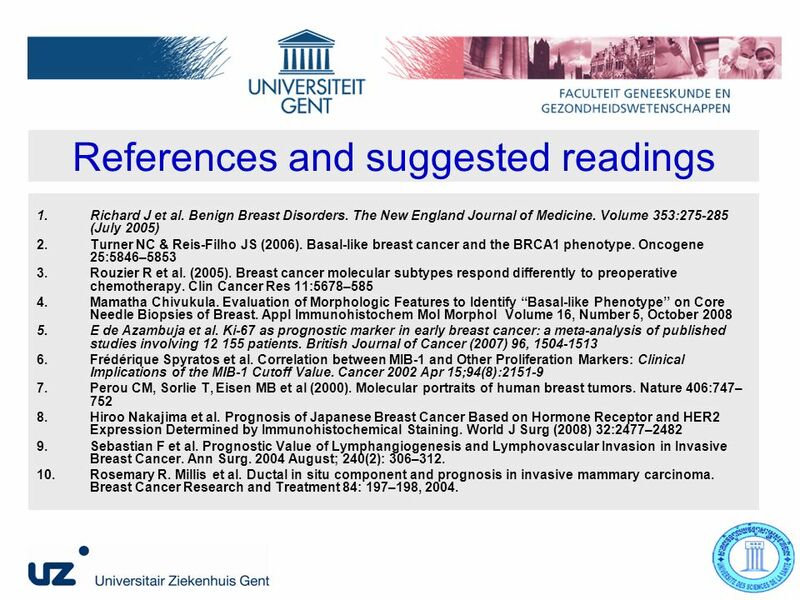 50 References and suggested readings 1.Richard J et al. 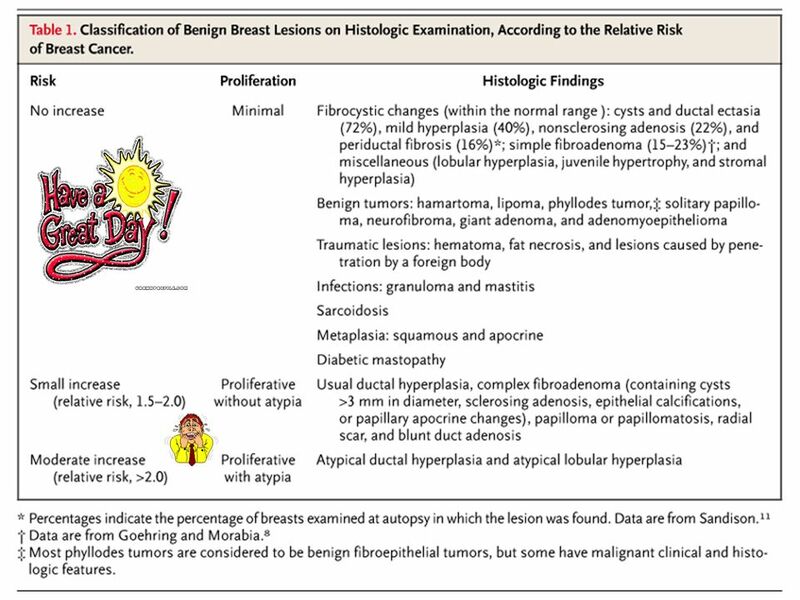 Benign Breast Disorders. 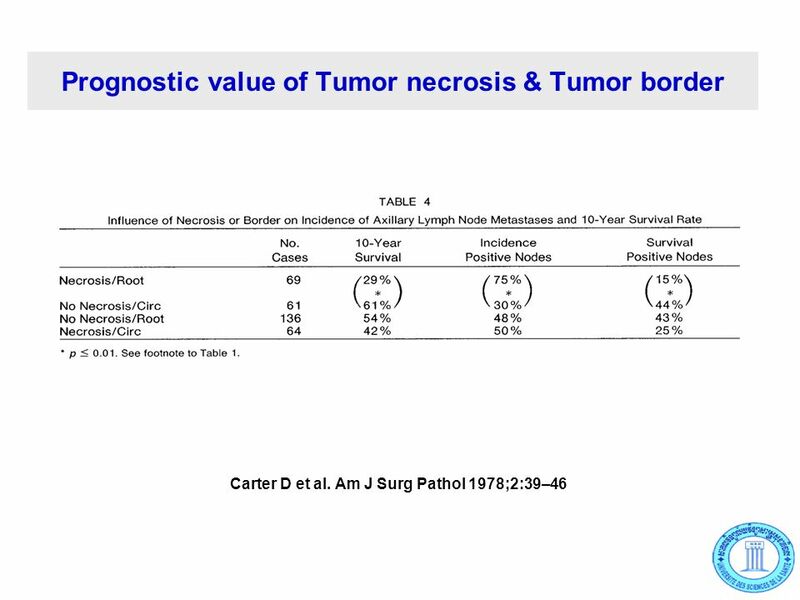 The New England Journal of Medicine. Volume 353:275-285 (July 2005) 2.Turner NC & Reis-Filho JS (2006). 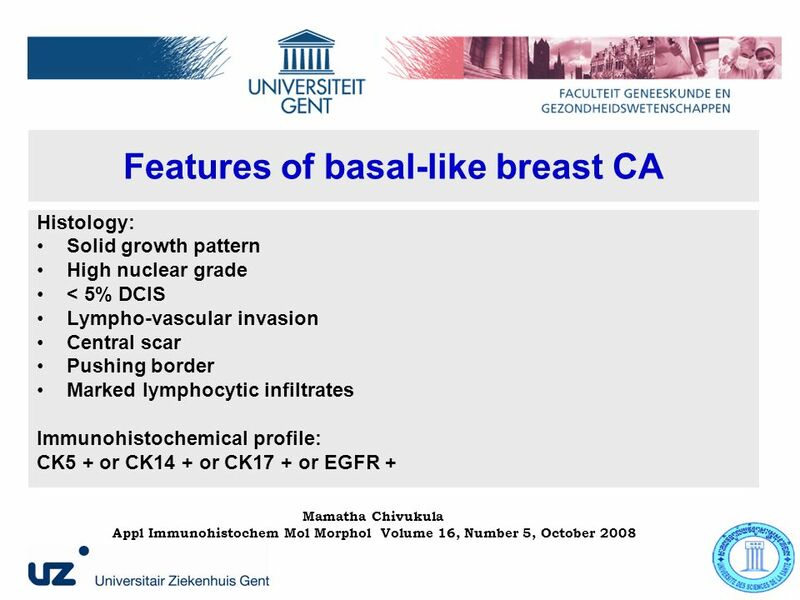 Basal-like breast cancer and the BRCA1 phenotype. 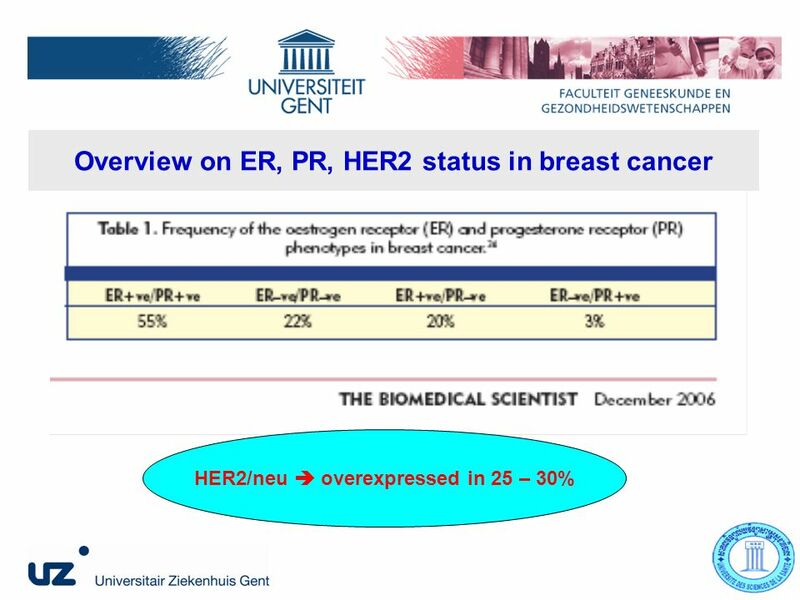 Oncogene 25:5846–5853 3.Rouzier R et al. (2005). 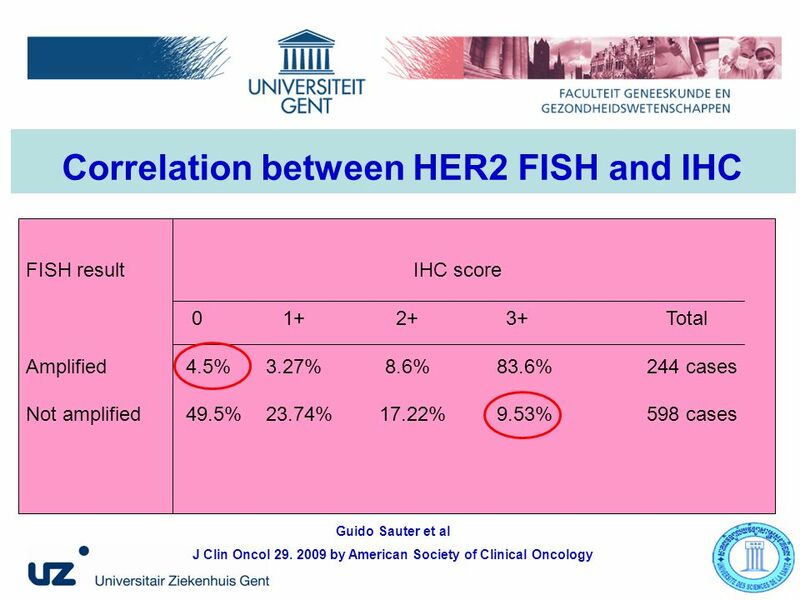 Breast cancer molecular subtypes respond differently to preoperative chemotherapy. 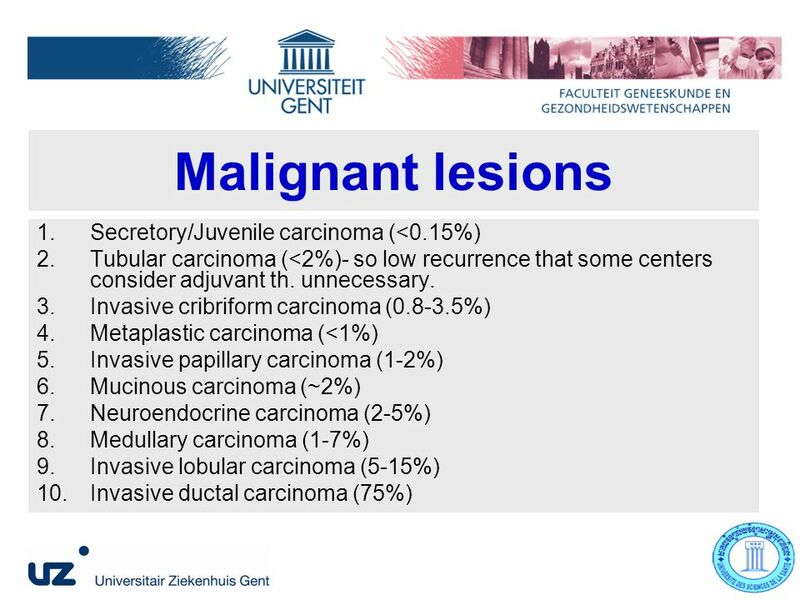 Clin Cancer Res 11:5678–585 4.Mamatha Chivukula. 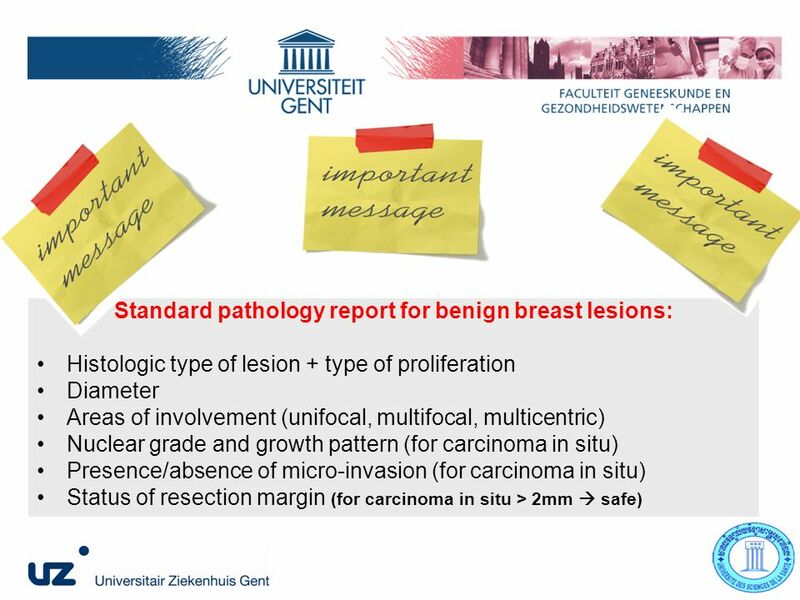 Evaluation of Morphologic Features to Identify Basal-like Phenotype on Core Needle Biopsies of Breast. 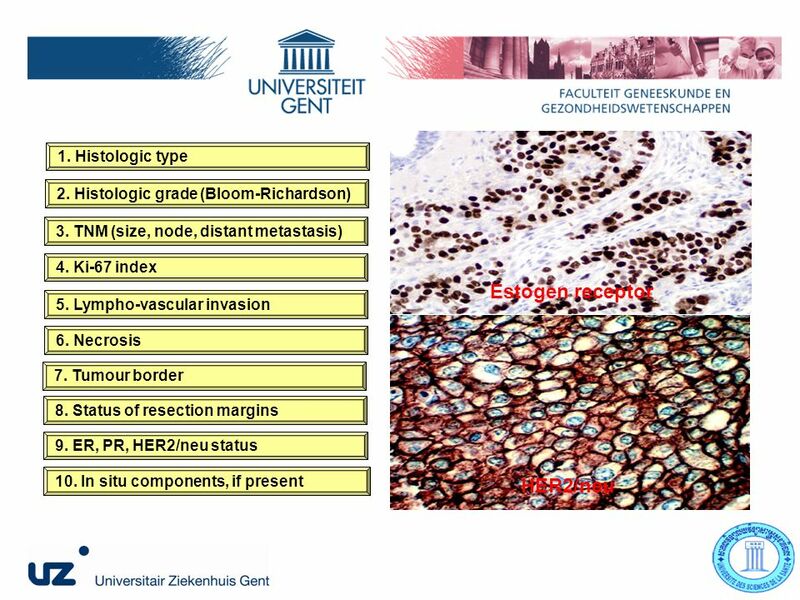 Appl Immunohistochem Mol Morphol Volume 16, Number 5, October 2008 5.E de Azambuja et al. 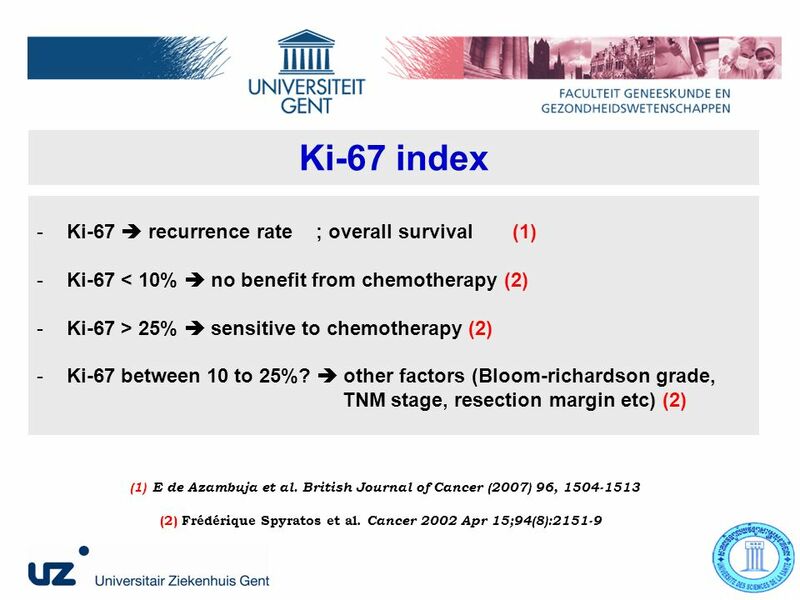 Ki-67 as prognostic marker in early breast cancer: a meta-analysis of published studies involving 12 155 patients. 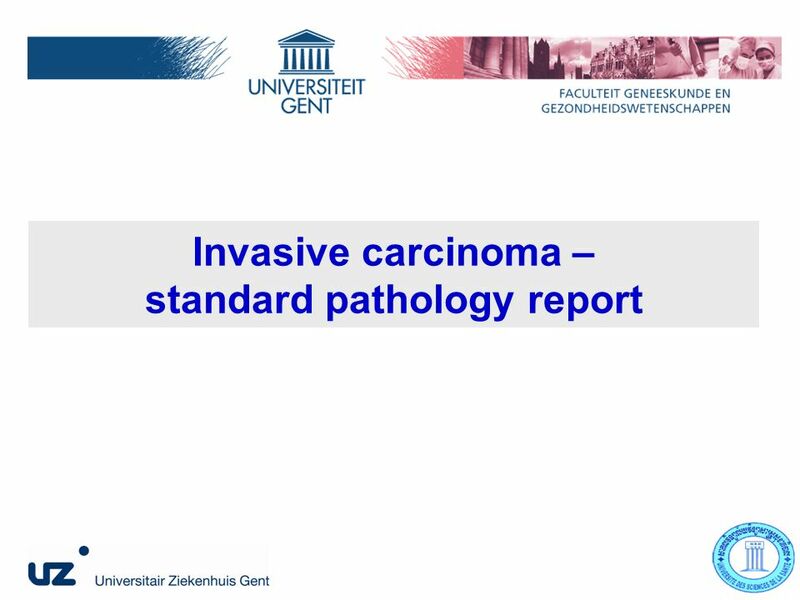 British Journal of Cancer (2007) 96, 1504-1513 6.Frédérique Spyratos et al. 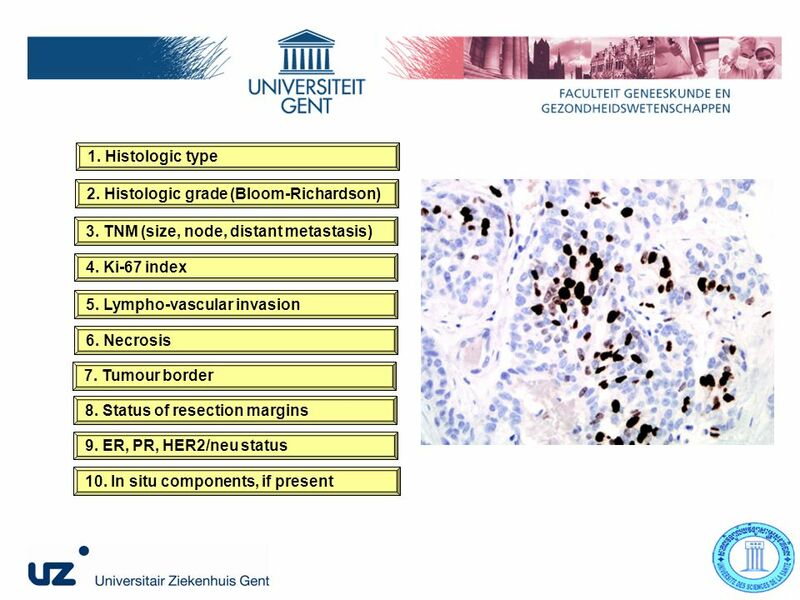 Correlation between MIB-1 and Other Proliferation Markers: Clinical Implications of the MIB-1 Cutoff Value. 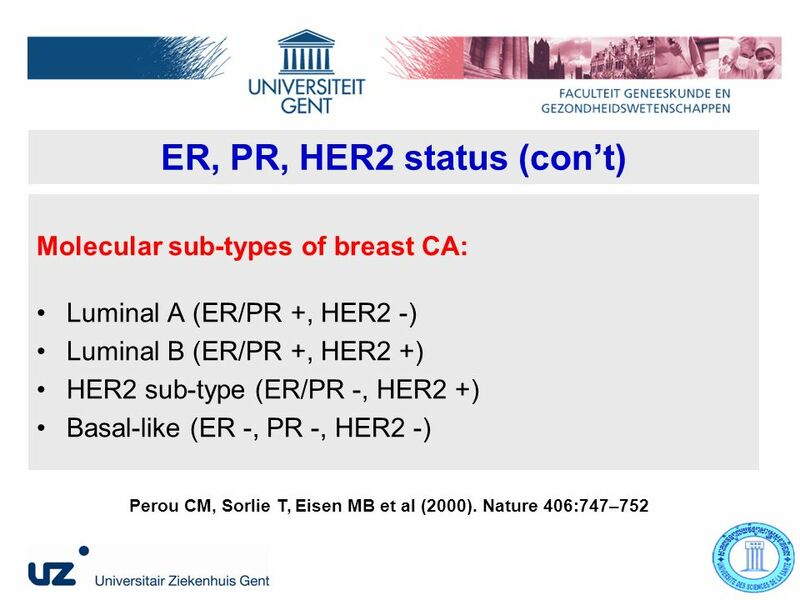 Cancer 2002 Apr 15;94(8):2151-9 7.Perou CM, Sorlie T, Eisen MB et al (2000). 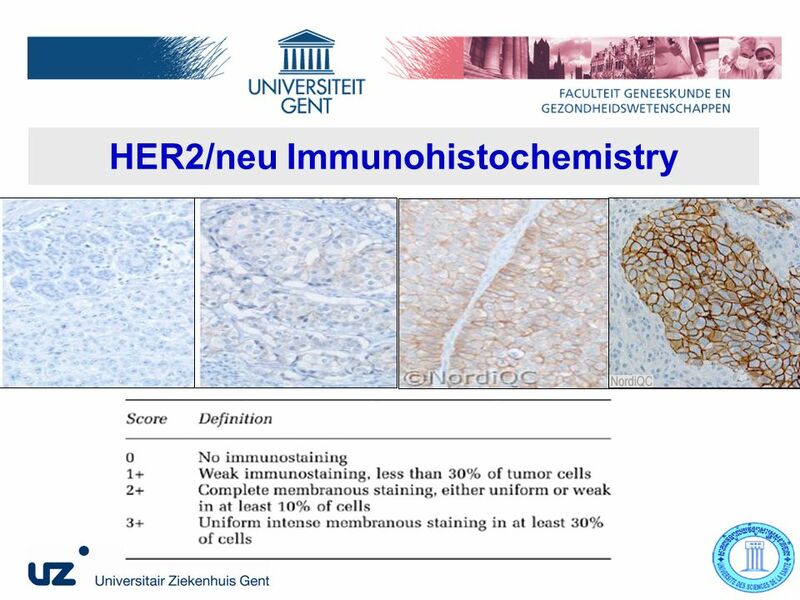 Molecular portraits of human breast tumors. Nature 406:747– 752 8.Hiroo Nakajima et al. Prognosis of Japanese Breast Cancer Based on Hormone Receptor and HER2 Expression Determined by Immunohistochemical Staining. 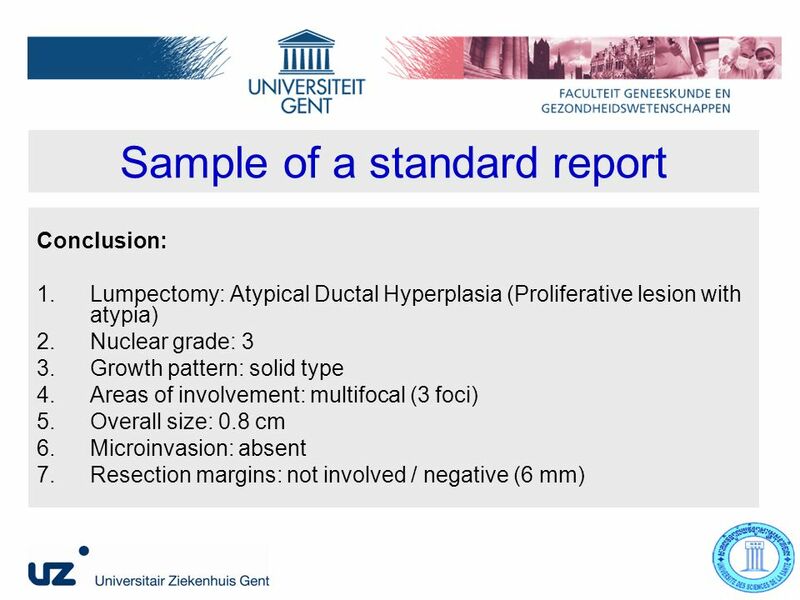 World J Surg (2008) 32:2477–2482 9.Sebastian F et al. 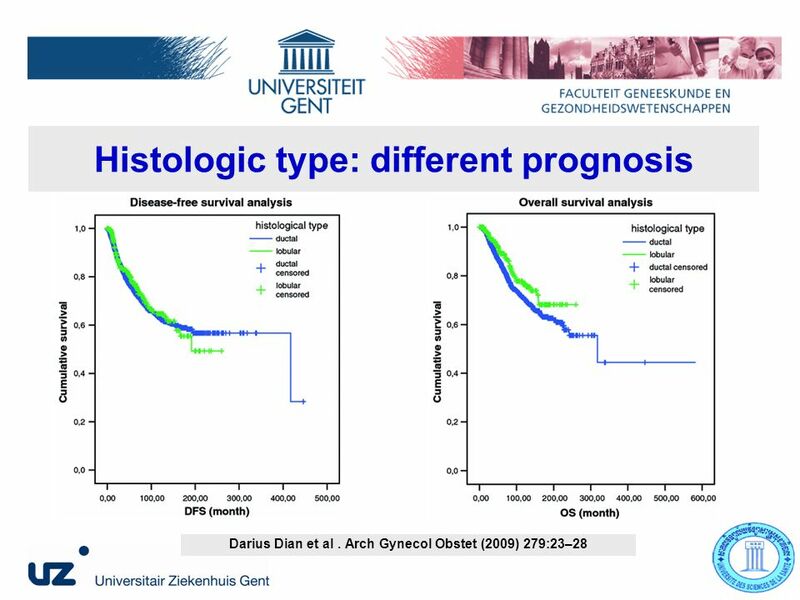 Prognostic Value of Lymphangiogenesis and Lymphovascular Invasion in Invasive Breast Cancer. 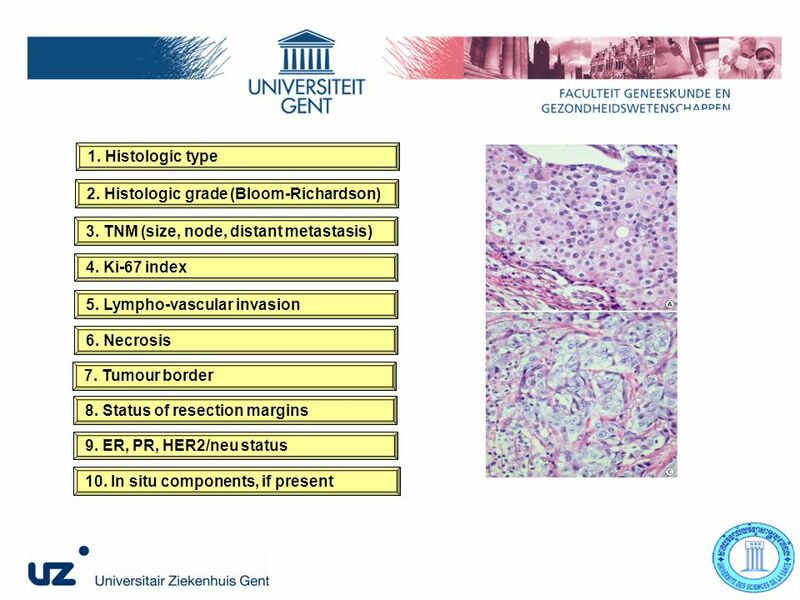 Ann Surg. 2004 August; 240(2): 306–312. 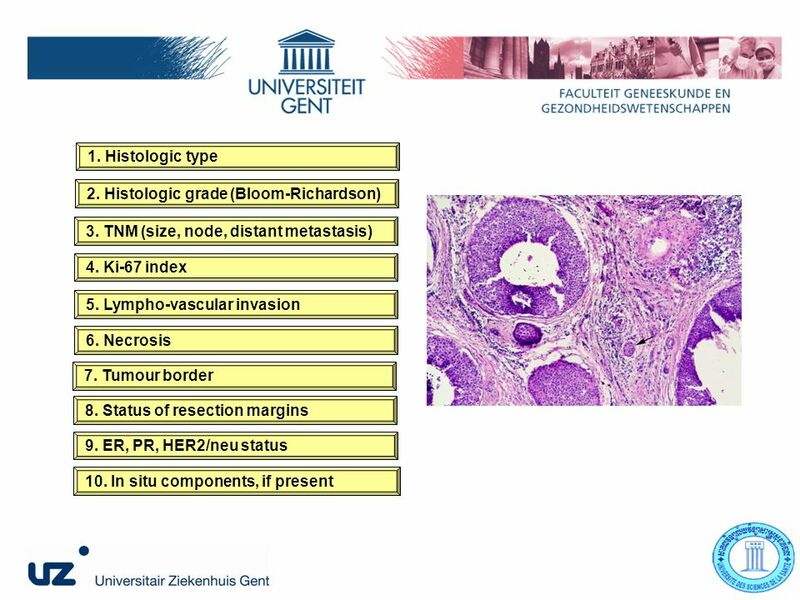 10.Rosemary R. Millis et al. 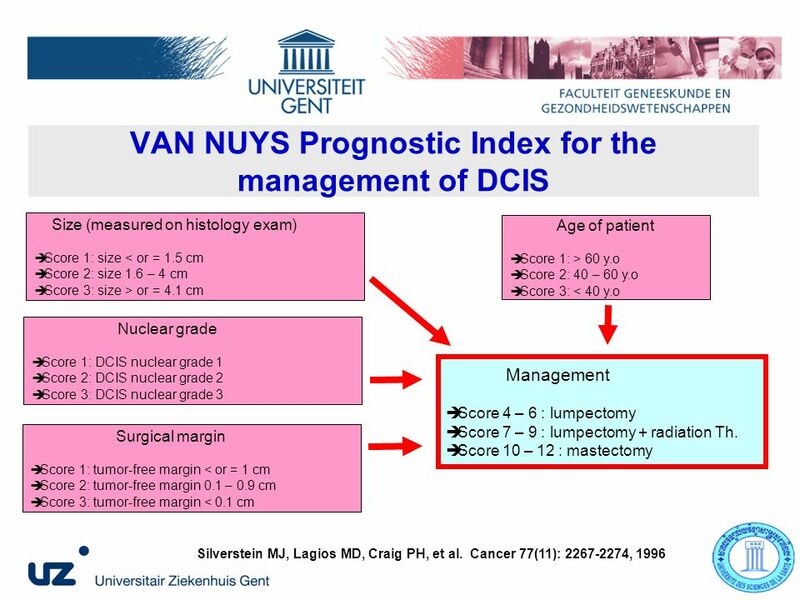 Ductal in situ component and prognosis in invasive mammary carcinoma. 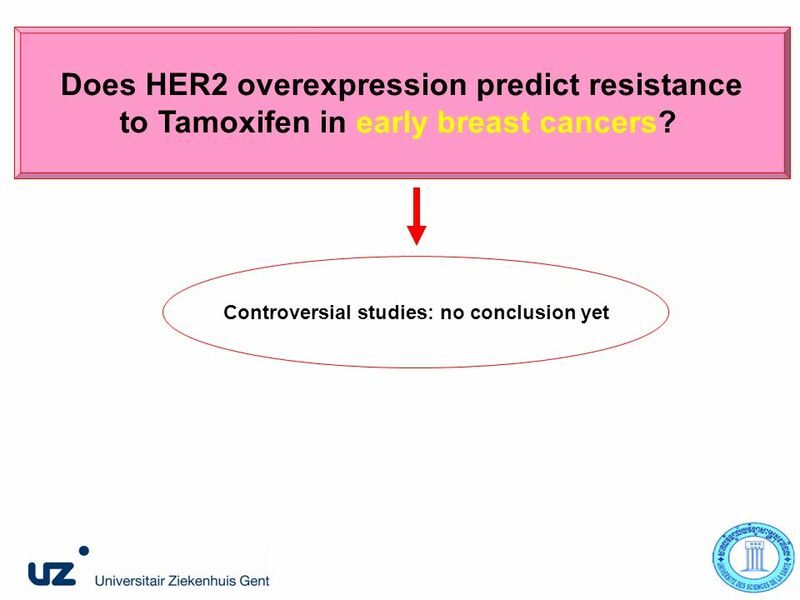 Breast Cancer Research and Treatment 84: 197–198, 2004. 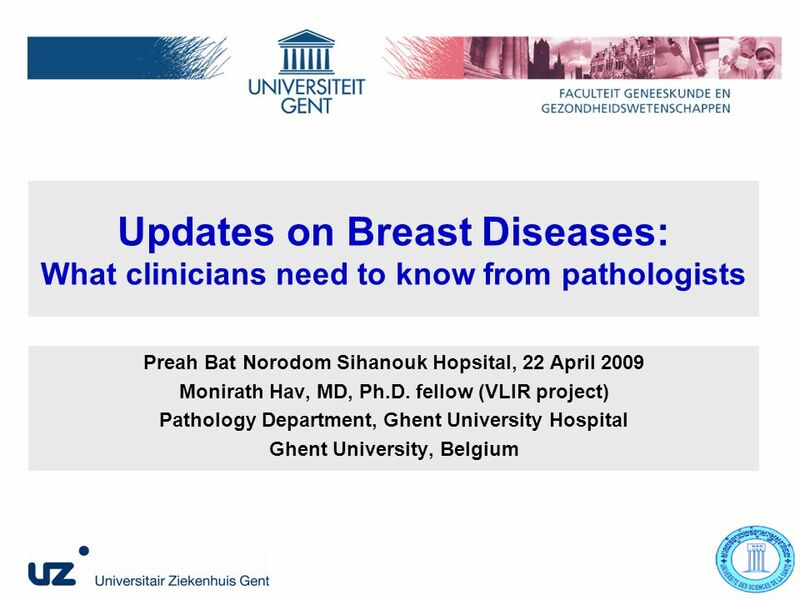 Download ppt "Updates on Breast Diseases: What clinicians need to know from pathologists Preah Bat Norodom Sihanouk Hopsital, 22 April 2009 Monirath Hav, MD, Ph.D. fellow." 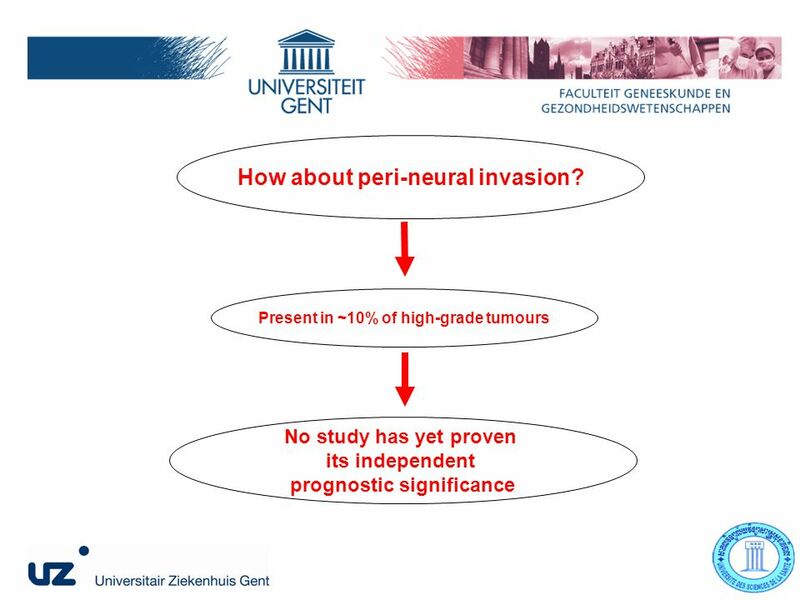 Tumor Size and Sentinel Node Procedure A. Ph. 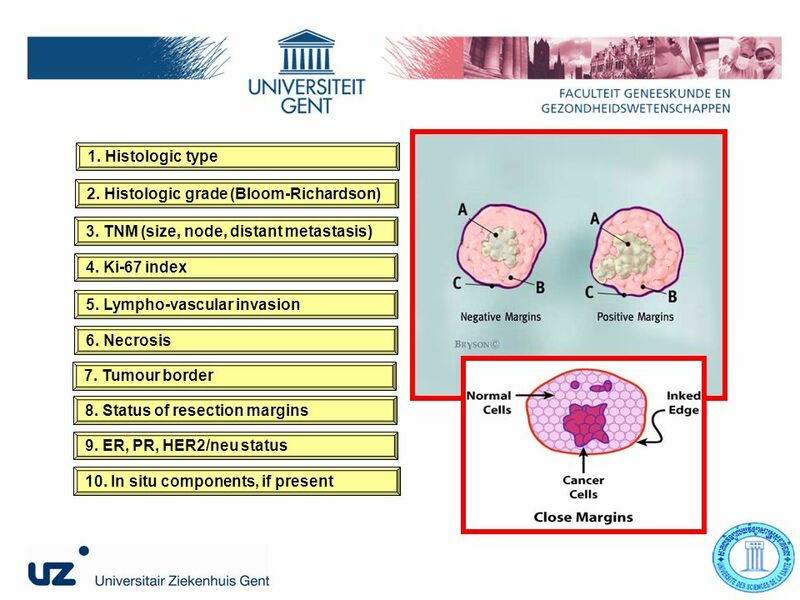 MAKAR, MD, Ph.D. R. Van Den Broecke, MD, Ph.D. 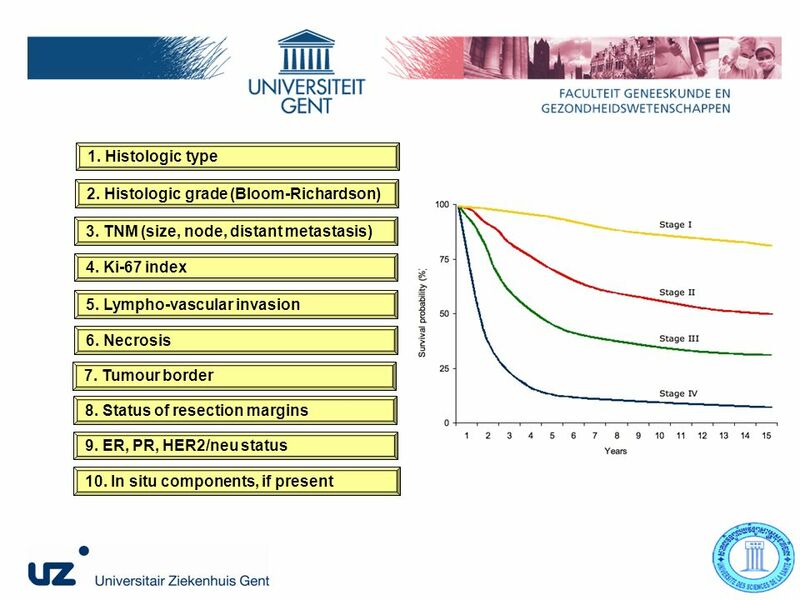 Depart of Senology & Gynaecologic Oncology The Middelheim. 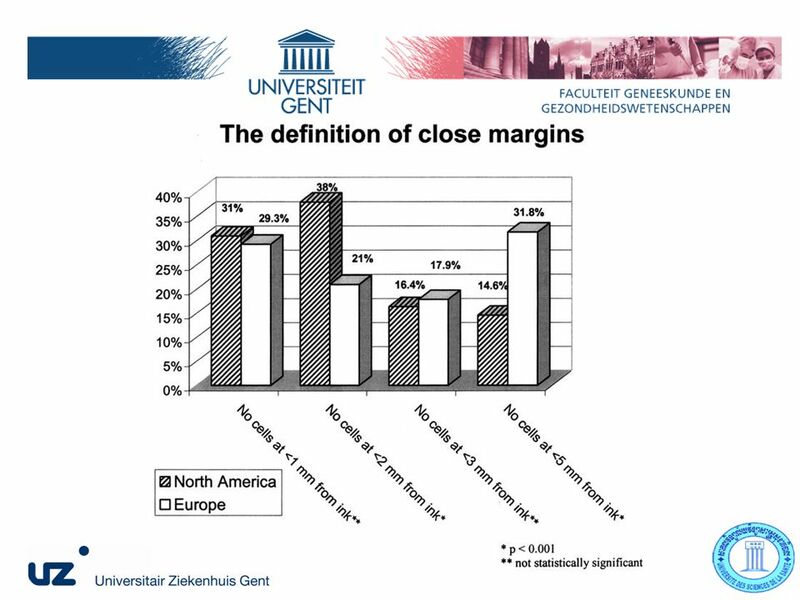 USC Institute of Urology ‘Minimal-margin’ Unclamped Partial Nephrectomy: Histologic & Anatomic Basis Raed Azhar, MD MS FRCSC Clinical Fellow, Robotic Surgery. 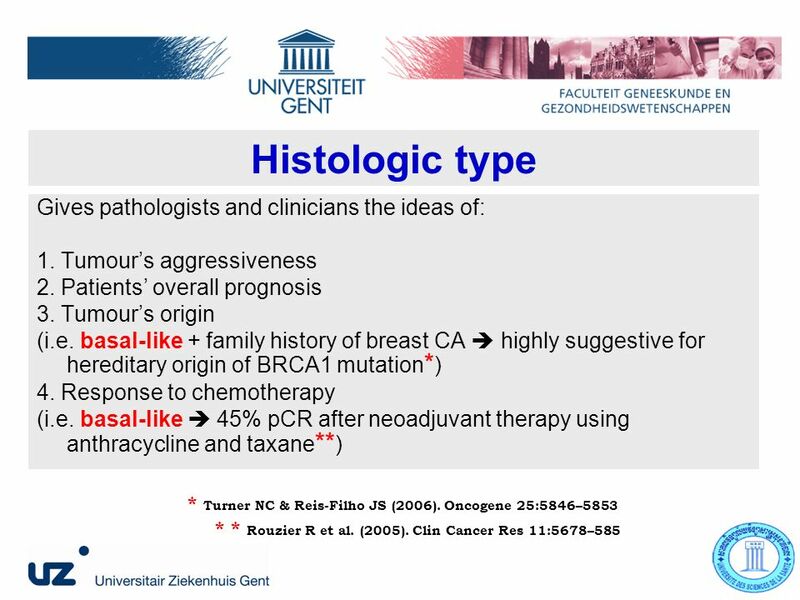 Breast Pathology Helge Stalsberg MD University Hospital of North Norway. 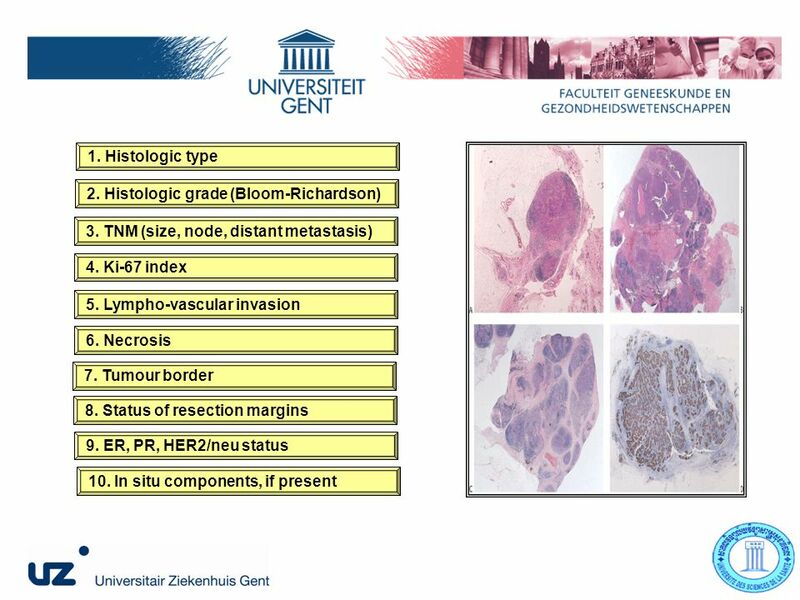 Slide Seminar Sami Shousha, MD, FRCPath Department of Histopathology, Charing Cross Hospital & Imperial College, London Amman, November 2013. 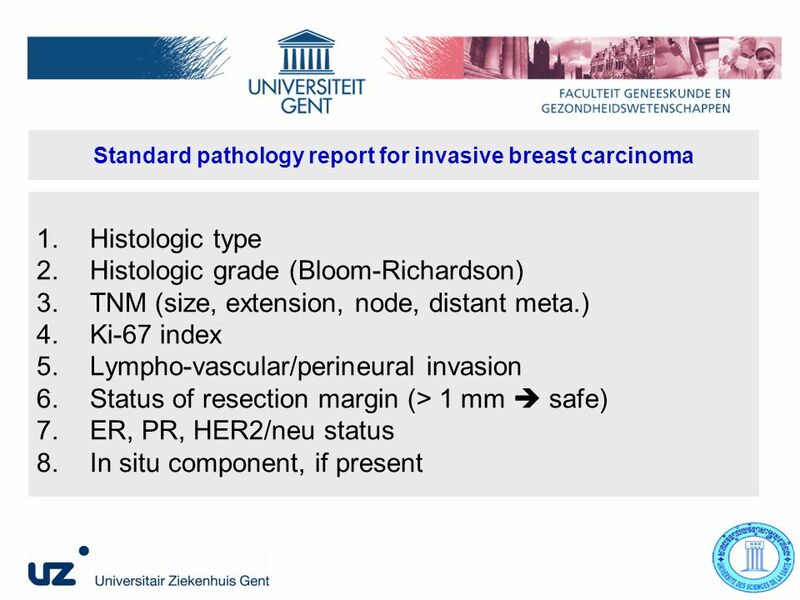 Breast Cancer Tumor Board Chair Harold Burstein, MD, PhD Faculty Jennifer Bellon, MD Mehra Golshan, MD. 62 years old man Main complaint: Back pain at night but not during the day Loss of appettite Weight loss. 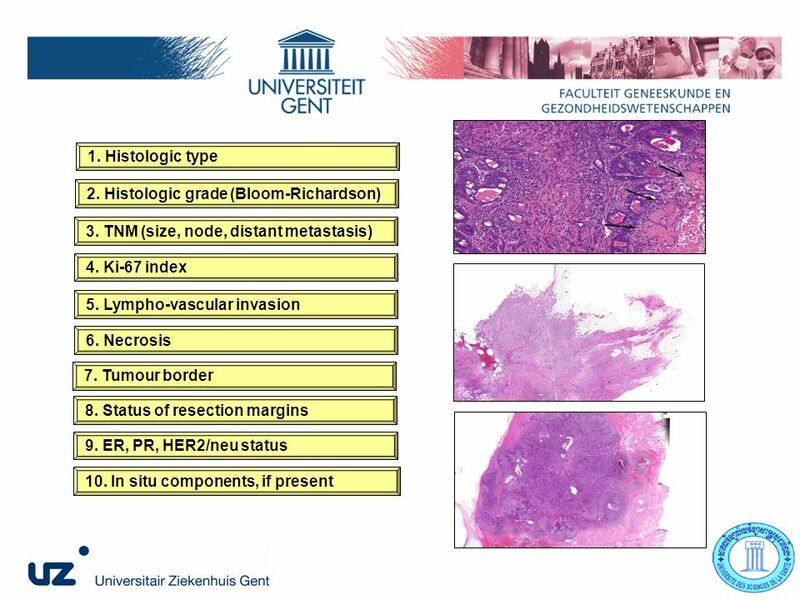 Breast Carcinoma. 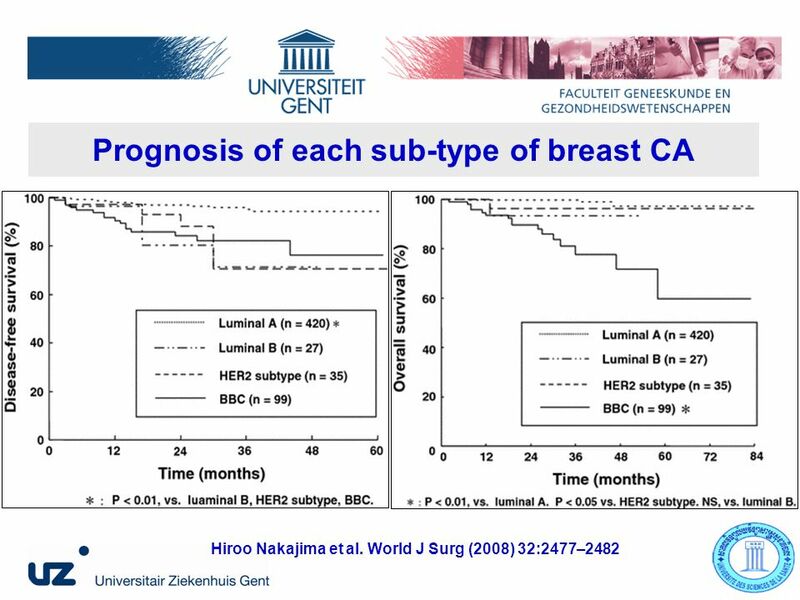 Anatomy Epidemiology: 10% 17.1/10 28/10 46/10 1.2 m world wide 6% develop cancer of the breast in their lifetime. 50,000 to 70,000.